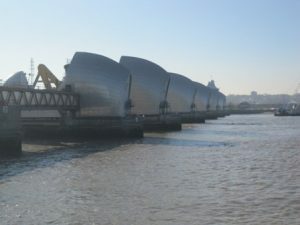 The Thames Barrier is constructed across the River Thames at Woolwich Reach which is to the east of Canary Wharf, to the south of Victoria Dock and to the north of Greenwich. During very high tides and storm surges the Thames Barrier is raised across the width of the River Thames and prevents the tidal river from flooding London. The barrier is the second largest in the world after Oosterscheldekering in the Netherlands and was planned after a severe storm caused major flooding along the coast and in London in 1953. Work started on the barrier in 1974 and was completed in 1982. Flood defences further downstream were also strengthened and include a raisable barrier across the nearby River Roding, if this had not been done the raising of the Thames Barrier would have worsened flooding in these areas. The barrier is built across a half kilometre wide stretch of the river and consists of 9 piers the tallest of which are the height of a 5 storey building. These separate the river into 6 navigable and 4 non-navigable channels, between the piers hollow metal flood gates are suspended, these have a semi-circular cross section. When the gates are open the curved part sits in a nest in the river bed to allow the river through, in this position the gates are full of water to minimise buoyancy. The gates are closed by rotating them up from the river bed so that they stand up vertically against the current and block the river, in this position they have been drained of water. London is sinking at a rate of 2 millimeters per year and water levels are rising at a rate of 6 millimeters a year, because of this a new barrier will eventually have to be built. The Thames Barrier can be seen from the Thames Barrier Park on the north bank of the river, or from the Thames Barrier Information Centre on the south bank. The centre has an exhibition, a cafe and a pleasant picnic area. An even better way of seeing the barrier is from a sightseeing boat, these depart from Westminster pier and Greenwich pier and afford excellent views of the barrier and other points on the river although they don’t stop at the barrier. The barrier is at its most impressive when raised. The schedule for raising the barrier for maintenance (which occurs once a month) can be obtained from the Information Centre (tel: 8305 4188). There is a charge for entry to the Information Centre exhibition. Nearest Underground/DLR Stations: Pontoon Dock DLR (2 minute walk to Thames Barrier Park), Woolwich Arsenal DLR (40 minute walk to Information Centre).